October 4 is one of our favorite days of the year. It marks the first day of the existence of our business three years ago; a milestone that will forever be important to us both. It's a day that reminds us that dreams can come true, that taking risks can bring rewards, and that God is faithful when we obey His call in our lives. October 4 brings us into an attitude of celebration for all the lessons we have learned, all the people we have met, all of the projects that have been completed and all of the photographs that have been taken—through God's power at work within us. We're not all that important or skilled or intelligent, but God has somehow used us anyway. We're so grateful! I'd be lying if I told you that running Langhoff Creative has been easy. Even from day one (October 4, 2010), we faced challenges. Because we knew beyond a shadow of a doubt that this business was God's plan for us, we attacked it hard, but we've also met opposition along the way. "There was a major spiritual battle going on [in Daniel 10]. Thanks to Daniel's continued prayers, this person was able to make his way to Daniel to encourage him in his future. It's such a powerful reminder to me that I need to pray fervently and EXPECT great things from God. He WILL guide me and there's definitely a holy battle going on... especially when I'm doing the Lord's work! Not only do I start working today for God—in the form of Langhoff Design, LLC [now Langhoff Creative, LLC]—but I go into battle! I will be on guard..."
Can you imagine if we could actually SEE the spiritual realm raging around us on a daily basis? When we pray for something or begin something new, I think we often assume God will just wave his magic wand and it will be so. Don't get me wrong, nothing is too difficult for God, but we must also remember that there are spirits of opposition trying their best to thwart God's plans. Anything that threatens the growth of God's Kingdom or His greatness is a direct threat to the Enemy and his entire entourage. We've learned over the last three years that no matter what rages around us, we must remain confident in what God has promised, humble in the way we carry out our daily plans, fervent in our prayers, and on guard for unseen obstacles that may confuse, distract or prevent us from succeeding. October 4 reminds us to celebrate and motivates us to stay the course. 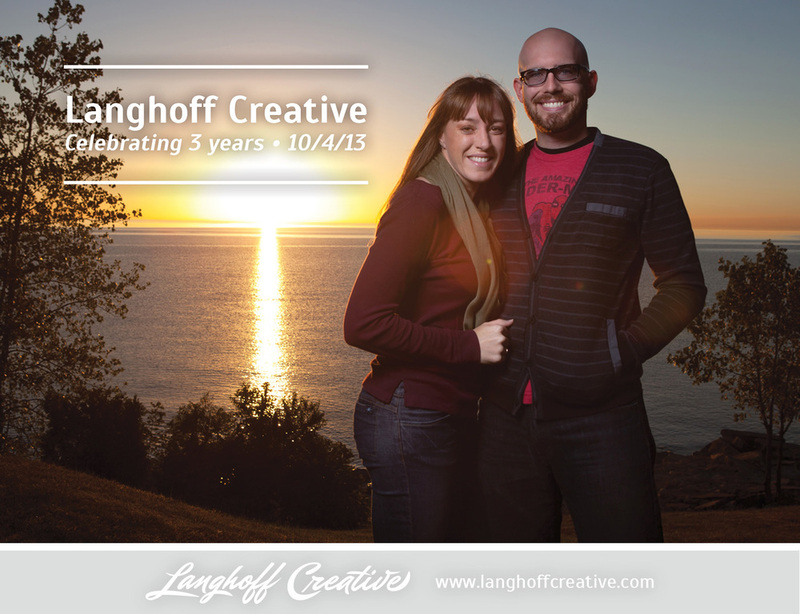 From the bottom of our hearts, thank you for your love, support and encouragement in the first three years of Langhoff Creative. Cheers!